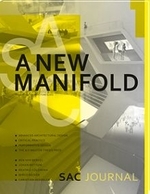 A NEW MANIFOLD, the inaugural issue of SAC JOURNAL, addresses the increased specialisation and possible fragmentation of expertise within architecture. Whilst historically always an amalgam of numerous forms of input, architecture is currently facing the necessity to assimilate and process hitherto unprecedented amounts and rates of information flow. How can architecture relate to emerging forms of specialisation within the discipline - not the least in its pedagogy and academic programmes?